Can Ryan Fitzpatrick live up to his six year $59 million contract extension? With the Super Bowl around the corner, this 2011-12 NFL season is coming to a close. Every season, things just don’t work out the way you want them to and in the end, only two teams can compete for a Super Bowl. Let’s look at some of this season’s biggest disappointments. All I can do is laugh at the Buffalo Bills. They started the season going 3-0, including a win over Tom Brady, and all of a sudden were receiving hype. The Bills were the talk of ESPN and almost every other huge sports network at the time. But what they didn’t know that this is the Buffalo Bills we are talking about. I mean, the team hasn’t been competitive in years and after a couple big wins they had them in the playoff discussion? Please. Giving Ryan Fitzpatrick a huge contract extension was one of the biggest decisions they could have made. The guy fluttered toward the end of the season and once again, the Bills finished last in their division. Many of us, including me, thought the Bucs would really push for Wild Card spot after last season’s impressive finish. But what do you know? The entire team took two huge steps backwards. They weren’t even competitive in some games losing 48-3 to San Fran and 37-9 to Houston. This is really disappointing for a team that was expecting to make a playoff run. Josh Freeman showed a sophomore slump as he threw 22 interceptions compared to last season’s six. Can’t win like that. 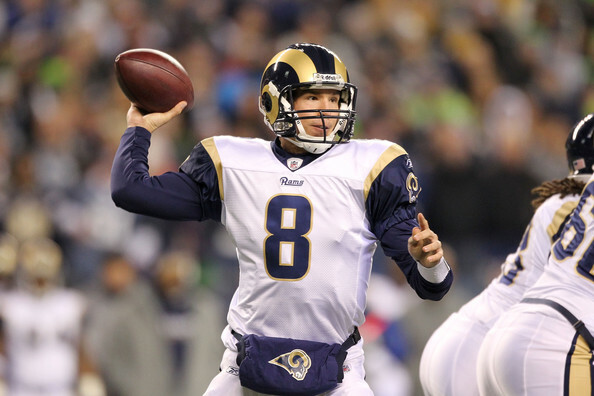 Talk about a sophomore slump; just take a look at Sam Bradford. I’m not sure what happened, but he definitely didn’t look like the same quarterback from last season. His completion percentage (53.5%) was almost as bad as Tim Tebow’s. Bradford simply didn’t look comfortable all season. He struggled with a lot of simple throws and just couldn’t seem to find the end zone (granted he didn’t have much to work with). Now that the Jim Fisher era is beginning in St. Louis, let’s hope Bradford can get back to his usual self. I really can’t wait to see what’s going to happen to the Jets this offseason. Their season finished in a complete disaster, losing their final three games to miss out on the playoffs. Usually when Rex Ryan is faced with must win games to make the playoffs, the Jets usually find a way to win, but it was different this season. Nothing seemed to click. The defense wasn’t the same, allowing teams to run all over them. The offense didn’t help either as the Mark Sanchez to Santonio Holmes connection might come to an end. Someone please tell me how Norv still has a job? The fact that this team missed the playoffs and allowed Tebow to win their division is completely unacceptable. Norv has proven that he isn’t the guy that’s going to get this team over the hump. The Chargers just didn’t look ready to play. Philip Rivers definitely didn’t help, having his worst season of his career. I really think it’s about time for a makeover. I remember when I heard the news that the New England Patriots had acquired Chad Ochocinco and Albert Haynesworth, I was thinking Super Bowl. Indeed, the Patriots have reached the Super Bowl, but it was no thanks to Ochocinco or Albert. Albert didn’t even last the season, as he got cut midway thru. Ochocinco, on the other hand, can’t even get on the field. It just shows how much more complex the New England offense is compared to Cincinnati’s. Even though Chad hasn’t had impact on the team as he had hoped, I’ll give him credit for being a team player and not crying about it. Well the “Dream Team” was a no show this season and it proves that you can’t just buy a team. The Eagles lacked the team-continuity early in the season and it was too big of a hurdle to overcome. They went from being Super Bowl favorites to nearly getting Andy Reid fired. My favorite highlight of their season was when scrub quarterback Vince Young threw a pick six against the Seattle Seahawks in what was one of the worst passes I have ever seen. Note: I didn’t include the Indianapolis Colts because I expected them to do nothing without Peyton Manning. Is the Greatest Show on Turf back for an encore? •	David Garrard’s release before the start of the season will lead to Jack Del Rio’s release at the end of the season. Owner Wayne Weaver clearly stressed that Del Rio’s job will be on the line unless the Jags make a playoff appearance, so they might as well get a head start and fire him now. With Luke McCown or Blaine Gabbert at quarterback, I don’t see any way this team sneaks into the playoffs in the AFC. •	Terrelle Pryor will start more than one game this season. What do the Raiders have to lose? Jason Campbell isn’t going to take this team anywhere. Oakland will fall off and finish under .500 this season. •	Jamaal Charles will come close to the 2,000 yard mark. Charles exploded last season finishing 2nd in the league in rushing and 1st in yards per carry while spitting carries with Thomas Jones. With Matt Cassel still in limbo since Charlie Weis’ departure, Jamaal will have to carry the load. •	The Philadelphia Eagles will not win the NFC East. There are too many new pieces on that unit so I would expect them to start slow. They also bring in a new D-Coordinator in Juan Castillo, who was previously their O-Line coach. The offensive line has also been really shaky during the preseason. With this being said, it’s going to be interesting see if Vick can have the same kind of success from last season. •	The Andy Dalton experiment will only last one season. I fully expect the Bengals to draft Andrew Luck 1st overall in the 2012 NFL Draft. •	Jake Locker will have the best season out of all rookie quarterbacks. He looked solid during the preseason and was surprisingly accurate compared to his college days. Look for him to slide in front of Matt Hasselbeck by the season’s end. •	The Detroit Lions will clinch a Wild Card spot. They have slowly improved year after year, and Matt Stafford looks to be the real deal. They have playmakers around him in Megatron and Jahvid Best. The defensive line looks flat out scary. If Stafford can stay healthy, expect big things from this team. •	Tom Brady will win back-to-back MVPs. Everyone knows what Brady is capable of. •	Jimmy Clausen will throw more touchdown passes than Cam Newton. I expect both quarterbacks to see time as the Panthers will struggle in their rebuilding year. Cam is extremely inaccurate and hasn’t been too impressive thus far. •	Chad Henne will breakout. He’s always had the arm and frame, but his inconsistency has been a huge problem. Believe it or not, I think the addition of Reggie Bush is going to help a lot. Chad knows if he doesn’t start winning ballgames, his time in Miami is over. •	The Washington Redskins will finish top 5 in rushing. It doesn’t matter who the running back is, Mike Shanahan’s zone blocking always seems to make it work. •	The Greatest Show on Turf will return. Sam Bradford will pass for over 4,000 yards with Josh McDaniels at OC. Not to mention, Stephen Jackson’s inability to play an entire season. •	The Indianapolis Colts will miss the playoffs. It’s going to be ugly if Peyton Manning misses more than one game. Oh yeah, that one game he’s going to miss is against divisional rival Houston Texans. •	Eli Manning will play nowhere near Tom Brady’s caliber. Manning claimed to be in the same class as Brady, but throwing for multiple interceptions in the preseason isn’t going to help his case. I’ll expect another 20+ turnover season from Eli. •	The Houston Texans will win the AFC South. They are poised for a playoff run with Peyton’s injury and with potentially two rookie quarterbacks starting in their division. If they can’t do it this season, they never will. •	The San Diego Chargers will make the Super Bowl. Philip Rivers and Norv Turner know the window is closing. Statistically they had the best defense in the league and their offense is always high powered with Rivers, but it was the special teams that brought setbacks. I think this is the year they go on the radar and make that run.